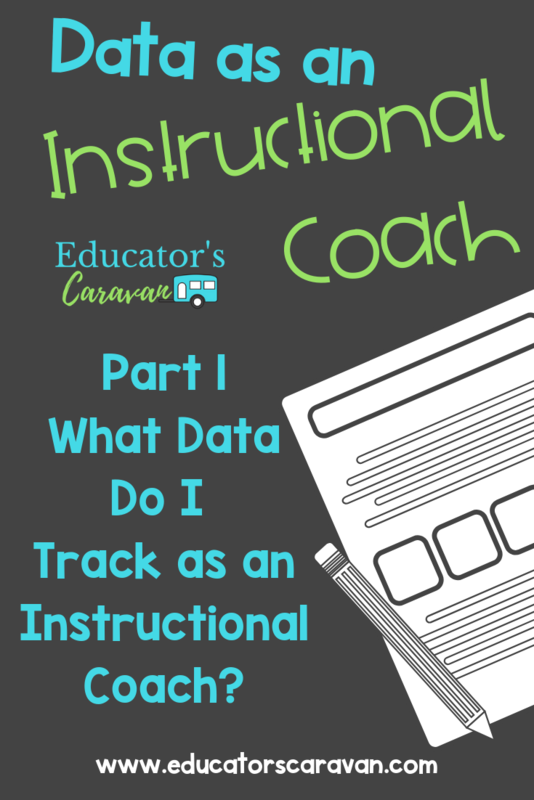 Data as an Instructional Coach Part 1 - What Data Do I Track as an Instructional Coach? A big part of being an effective instructional coach is using data driven information to help your help teachers do more for their students. While data can be your best friend in the classroom, it can be hard to know exactly what kind of data you need to be tracking. Between teachers and students, there is so much to observe. In addition to knowing what to track, it can be difficult to find a way to track your data effectively. So how can we ensure we are tracking the right data? Follow the tips and hints below for super data tracking! Keeping track of your teachers’ progress is data that you should track for your records especially if you have the same teachers year after year. When you first meet your teachers, you’ll set up a goal and the steps that need to happen in order to achieve that goal. After each observation, you should look at the teachers steps and write down anything that happened to get closer to moving up the ladder towards the overall goal. Tracking when the teacher masters each step and then, of course, the overall goal, is important. You would write down when the goal was achieved and evidence it was achieved. You can track this data on a simple teacher coach goal sheet that you keep with their observation sheets. If you are using standardized tests or states tests, you will want to look for specific content areas that need to be built upon. Once you identify the focus area, you’ll want to make a pretest, find resources to give the teacher to help teach that skill, then, after a sufficient amount of time, you’ll be able to give the students a post test and hopefully see growth. Between the pre-test and the post-test, there should be formal and informal assessments that will show whether students are progressing or not. You should track all of the physical numbers (the testing data) as well as the strategies and techniques that worked for the students. You can keep track of this data with a corrective action plan and keep it with your observation notes. If you decide to base your goal off of student observation, you can focus your instructional coaching on either academics or behavior. You can always observe areas where students seem to struggle. When you see struggling “cues” you can write them down and then make a goal with the teacher. Then you would follow the same steps as before. After taking the above steps, you’ll track the same type of data you did before. Sometimes what you are coaching isn’t how to teach an academic concept. You may find yourself coaching a teacher on classroom management. This can be especially true for new teachers. Whenever people are new to something it takes them time to get adjusted to it and you’re there to help them adjust. When you decide to set a behavioral goal with the teacher, you follow a similar process as you did with academics. You want to make sure write down the overall goal with the teacher. Next you’ll want to find the teacher resources to help the teacher with different strategies to achieve their goal. Finally, you work with the teacher and observe how these strategies are working in the classroom. You can keep track of this data by noting student behavior and the overall “fluency” of the classroom. If the classroom is running smoother, the strategies are working. Keeping data as instructional coach is vital to your success and the success of the teacher. You want to ensure you have clear goals so you have accurate data. As instructional coach you’ll want to keep data for your teachers, you’ll also want to track student success data. Doing both ensures you are helping your teacher help their teachers all year long. How do you currently track data for your work as an Instructional Coach?